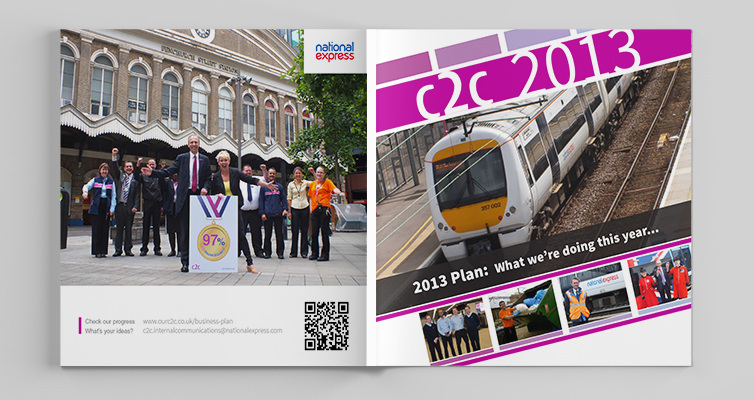 Our designer Mike created these two business plans for c2c Rail, which were distributed to approximately 650 staff and external stakeholders. At the time, the train operator was undergoing a period of substantial change, so communication was vitally important. 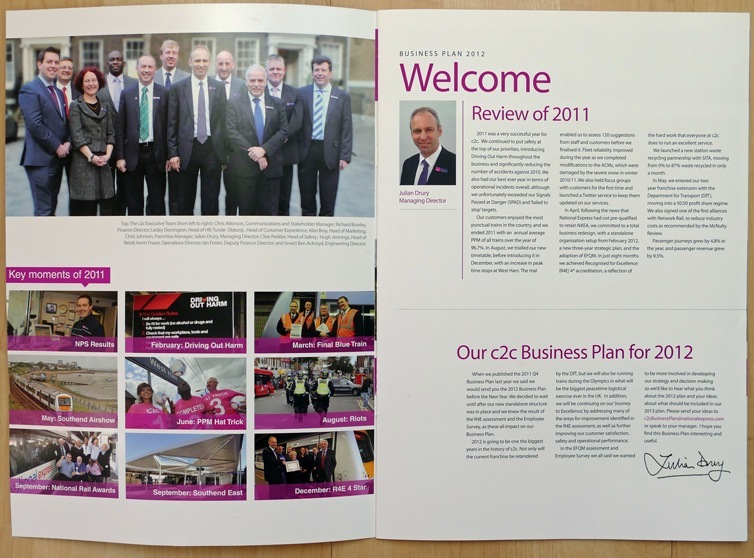 The annual publication of a business plan and strategy plan was also a key part of their business excellence process, called Recognised for Excellence. 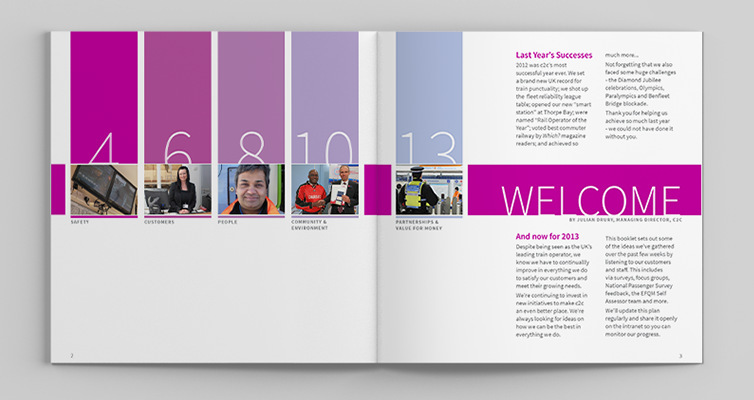 For 2013, the business plan design was purposely bright and colourful, with lots of imagery. The text content was slimmed down to just the essential information. It was presented in a square format, on thick glossy pages. 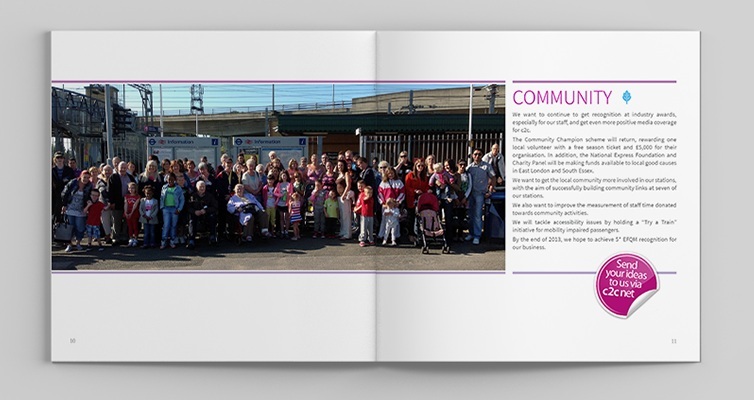 An innovative approach was to use the company’s intranet site to provide additional information, which became the company’s main internal communications channel. Progress on delivering the business plan was published on the intranet each quarter. This proved a success, making it very appealing to read, and helped improve c2c’s staff engagement scores. During focus groups, staff showed strong familiarity with the business plan, which demonstrated its success. The previous year’s business plan (shown at the bottom) was a more traditional, formal design, printed on A4 pages. It introduced the company’s new values and associated icons, with each section being colour coded. Are you interested in a business plan design for your own organisation? Please contact us so we can discuss your requirements.